Put on gloves. Be careful not to tear or puncture the glove. Correct way to put on a latex glove. 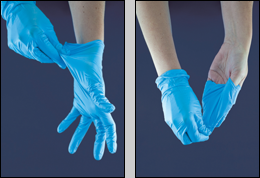 Remove gloves using a glove-to-glove/skin-to-skin technique. Discard gloves immediately into the garbage. Clean your hands following correct hand washing or sanitizing procedure. Grasp outside edge near the wrist and peel away, rolling the glove inside-out. Reach under the second glove and peel away.